Registration is now open for SPE’s 53rd National Conference, Constructed Realities, to be held March 10 – 13, 2016, at the Red Rock Resort in Las Vegas, NV. Preview the conference schedule and register online today to qualify for early rate pricing! The early rate ends January 4, 2016. Congratulations to our 2016 Honored Educator, Jim Stone! The Red Rock Resort will serve as the primary location for conference programs and events. Rooms are available for SPE attendees at the discounted rate of $165 + tax per night. Visit SPE’s reservation page for the Red Rock Resort and book your room today! You can also make reservations by calling the hotel reservation line at 866-767-7773. Please reference SPE’s 2016 National Conference when making your reservations. The reservation cut-off date is February 17, 2016. We also offer discounts on flights through United Airlines and multiple car rental companies. Click here for more information. SPE is looking for committed student members to participate as volunteers at the conference. Volunteers who have completed the service requirement will receive a full conference registration rebate. Student portfolio critiques and professional portfolio reviews remain free of charge, but space is limited and pre-registration is required. SPE seeks both student and professional portfolio reviewers to share their expertise and feedback with conference attendees. In return, SPE will offer reviewers a 50% discount on registration. If you are interested in reviewing portfolios at the conference, please contactportfolio@spenational.org with your name, institution, and any opportunities you can offer reviewees by no later than November 11. Attendees interested in displaying work at the Curator Portfolio Walkthrough must pre-register for the event. Space is limited, so register today! Visit spenational.org/conferences/schedule for a full line-up of conference events! The Society for Photographic Education (SPE) Women’s Film Festival has featured innovative and provocative short documentaries, animation and fiction by women directors since 1995. The 2016 festival will be screened in Las Vegas, NV, on Friday and Saturday, March 11 & 12, at the 2016 SPE National Conference. Narrative, documentary, animated and experimental shorts under 30 minutes, directed, produced, edited or shot by a woman are eligible. All rights must be cleared. There is no entry fee for submissions received by 11:59 PM, October 31, 2015. Early submissions appreciated. Preference will be given to films submitted by the October 1, 2015. Late submissions will be accepted until November 8, 2015, with an entry fee of $15. To submit late, contact estomin@lycoming.edu for instructions. Email the following information to estomin@lycoming.edu with WFF16 as the subject line. Accepted filmmakers must provide a Quicktime H.264 file at the original dimensions, up to 1920px x 1080px, by Nov. 18. All selected work will be screened at the conference plus films will be streamed 24-7 Thursday-Sunday over the hotel TV channel to conference participants’ rooms. Filmmakers may submit different work to more than one SPE Film Festival (Women’s Caucus Film Fest, Multi-Cultural Caucus Film Fest, LGBTQ Caucus Film Fest) but the same video cannot be submitted to multiple SPE fests. The Society for Photographic Education’s 2016 National Conference, Constructed Realities, will take place March 10-13, at the Red Rock Resort in Las Vegas, NV. SPE’s 53rd National Conference will feature four days of cutting-edge programming including presentations, industry seminars, an exhibits fair, portfolio critiques, a print raffle, silent auction, mentoring sessions, film screenings, exhibitions, receptions, a dance party, and more! Registration opens on November 2, 2015. 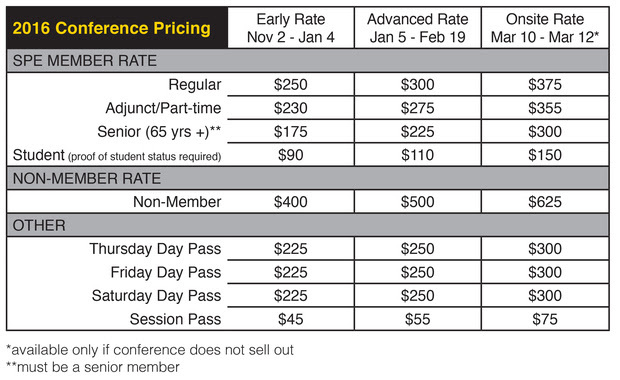 Pricing is structured to encourage early registration. SPE conferences have sold out in the past, so it is recommended that you register in advance. Stay tuned as we announce our line-up of evening guest speakers! Visit SPE’s conference page for more details and the conference schedule. Congratulations to Texas Woman’s University Alumna, Rachael Banks, for having her work Bo Jackson, Atwood Alley, and Accidents selected for the On Fruited Plains exhibition in Louisville, KY at the University of Louisville Schneider Hall Galleries. This exhibition is in conjunction with the SPE Midwest Regional Conference. The exhibition runs from October 1 through 31, 2015. Rachael is a Louisville, KY native who is living and working in Dallas, TX. She received her Master of Fine Arts degree in photography from Texas Woman’s University and Bachelor of Arts degree in photography and painting from Bellarmine University in Louisville, KY. Currently, Rachael is working as adjunct faculty at Texas Woman’s University and El Centro College in Dallas, TX. All SPE student members are eligible to apply for a scholarship to offset the cost of attending SPE’s 2016 national conference. Ten awards are offered based on merits of submitted portfolios and include a $550 travel stipend to attend the national conference, a 2016 national conference fee waiver, and a one-year membership to SPE. • Applicants must be current, matriculated undergraduate or graduate students enrolled at a post-secondary institution majoring/concentrating in photography and not graduating before the end of the academic year 2015-2016. • Applicants must be student members of SPE or become members before submitting their scholarship applications. Visitspenational.org to join or renew your membership. • Applicants are not eligible to receive scholarship awards for two consecutive years. This year’s jurors are SPE national board members serving on the Awards and Recognition Committee: Bill Gaskins (Chair), Sonseree´ Gibson, Mark Malloy, and Arno Rafael Minkkinen. Submit online via spenational.slideroom.com. There is a $10 fee for submitting a portfolio. If you need technical support, please contactsupport@slideroom.com. • A cohesive body of work with no more than FIVE images. Images around 1280 x 1280 px @ 72 ppi are ideal for good image quality and fast upload. • A clear and concise introductory statement that details the conceptual, technical, and aesthetic concerns, issues, influences or questions that your work explores (350 words maximum, approx. 2,100 characters). • A statement addressing how attendance at the conference will benefit you, as well as an overview of prior involvement with SPE or other arts organizations. • A brief resume, including name, address, phone number, email address and current institutional affiliation, and educational and professional experience. • Contact information for a current photography professor (includename, title, email, and phone number). Applications that do not fulfill all requirements may be eliminated from the competition. Click here to view the official call for entries. Deadline to apply is October 15, 2015, at 11:59 PM EST. Direct inquiries to the SPE national office at membership@spenational.org. Please visit spenational.org/conferences for additional conference information.